Sharpen your legal skills in simulated appellate court proceedings as part of Georgia Law's Moot Court teams. 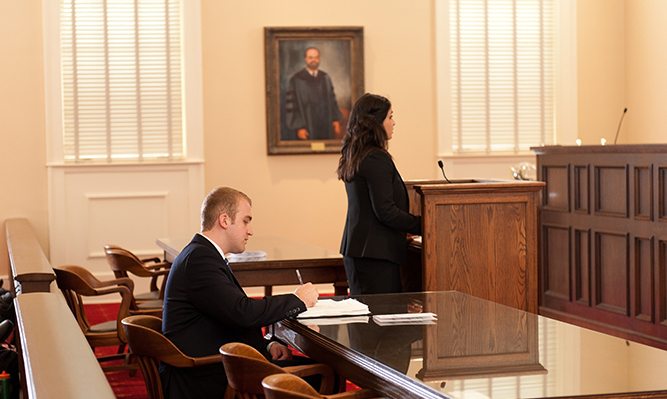 Participating on a Moot Court team gives you the opportunity to draft briefs and present oral arguments, appear before federal and state justices and judges and travel to local, regional and national competitions. Georgia Law's Moot Court program is supported by committed faculty members and Moot Court alumni who volunteer to judge practice rounds of oral arguments. Membership on the Moot Court teams is reserved for 2nd and 3rd year law students. 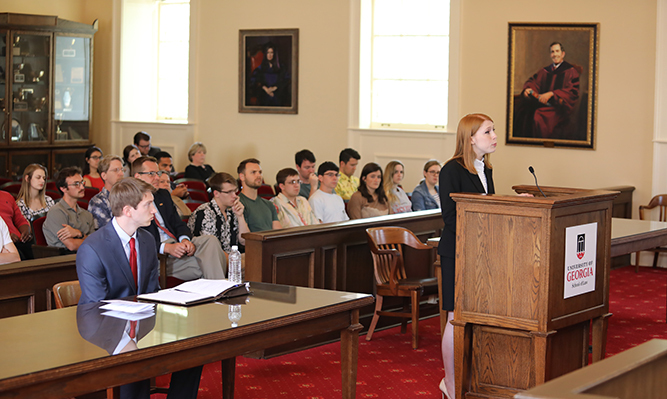 1st year students have the opportunity to present an appellate argument during the spring semester of their legal research and writing class. After presenting this argument, students may elect to participate in the Richard B. Russell Moot Court Competition and try out for the first 8 spots on the Georgia Law Moot Court team. Additional opportunities are offered through Moot Court exchanges with Gray's Inn of London, England, and King's Inn of Dublin, Ireland. For a complete history of Moot Court and Mock Trial wins, visit the winning reputation page. "Moot Court gave me the opportunity to work on real world legal problems with some of the brightest students in the law school. I developed advocacy and analytical skills you cannot receive in the classroom. It is, by far, the most valuable experience I had in law school."